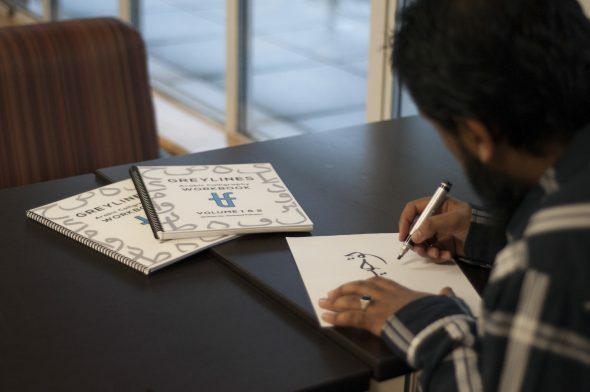 A Kwantlen Polytechnic University business student, Tauheed Faheem, has designed and self-published his own workbook, Grey Lines, to teach people the art of calligraphy. Faheem, who is also president of the Muslim Student Association, currently has two volumes of the workbook available as part of an ongoing LaunchGood campaign. Volume 1 focuses on basic pen control while Volume 2 builds on those skills to write shapes derived from Arabic letters. The goal of the LaunchGood campaign is to raise $8,000 and will run until Dec. 31. Faheem hopes to print a number of the books in bulk with the money raised, rather than printing them individually as they are ordered, and to expand the series to include third and fourth volumes. Any remaining funds may then go towards creating online tutorial videos about drawing lines, shapes, or pen angles that are involved in calligraphy. Faheem says he designed the workbook with young learners in mind, and sees them as a potential addition to elementary school classrooms. “I’m in discussion with a few schools and am trying to figure out a way that I can bring it into their system without it being too costly,” says Faheem. The booklet will be available to schools for $15.00 each, while Volume 1 starts at $25.00. The price increases from that figure with the inclusion of Volume 2. Careful thought and consideration went into every aspect of his workbooks’ designs, from the quality of paper to the page layout to the pens used to write in the book. Faheem made the books to be written on with permanent markers only. With semi-gloss pages, ink used in his books isn’t absorbed as quickly as with regular paper. “The ink will stay more stagnant on the page, so when you make a line, it will be more crisp,” says Faheem. Thinking back to the practice sheets he used in grade school to learn cursive and penmanship, Faheem remembers worrying that his lettering would never be as perfect as the computer-printed outlines intended to teach the user pen control. Because of this, he wrote each shape and line on the practice sheets in his book by hand to show the realistic outcome of practiced pen control. “I tried to make it so kids can actually feel like, ‘Oh, someone else did it by hand. I can also do it by hand.’ It makes them feel more comfortable in trying to learn,” says Faheem. He compares his workbook to a diary—in it, students are able to see their own progress and learn from their own mistakes.